My husband and I are big Domino's pizza fans and have family pizza night once every 2 weeks. We usually order their Honolulu Hawaiian Pizza, bbq wings and we love their Mac 'N Cheese Pasta Bowls. Our orders are always delivered freshly made and hot! 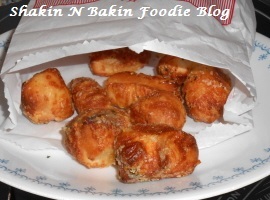 This past Friday evening we were treated to dinner by Domino's, so that we could try out their new Handmade Pan Pizza and Parmesan Bread Bites, both products we have never tried. We set up our ordered to be delivered at 5pm and it arrived at 4:59pm, right on time! The new Handmade Pan Pizza features a freshly made (not frozen) handmade pizza crust, 2-layers of delicious cheese and the toppings go all of the way to the edge of the pizza! Instead of being packaged in the classic Domino's white pizza boxes, these delicious pizzas are packaged in their new black pizza boxes. 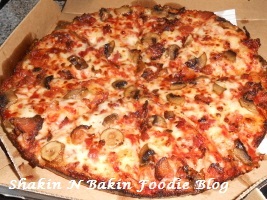 Domino's didn't invent the pan pizza but they sure did make it perfect! We received two different Handmade Pan Pizzas to try out for all of you! The first one had just a mushrooms topping on it and the second one had mushrooms and bacon. As soon as we opened the lid to the pizza boxes, we could smell that delicious pizza aroma! These "bad boys" were hot and just waiting for us to dig in! As we sampled our pizzas we noticed that these new Handmade Pan Pizzas do have a different taste to their crust, a buttery fresh homemade taste which we found to be delicious. The crust is a medium-bodied crust and bakes up crispy, golden...just the way we like our pizza crusts! The dough that Domino's uses in making these new Handmade Pan Pizzas is 100% freshly made dough and is NOT made from frozen pizza dough. We love cheese on our pizzas and normally we order extra cheese, but we didn't order extra cheese on these new Handmade Pan Pizzas because we knew they would come with 2 layers of cheese. If you are cheese lovers, you will be very pleased with the amount of cheese you get on these pizzas, so we do not recommend ordering them with extra cheese. We got one pizza with just a sliced mushrooms topping and the second one with sliced mushrooms and perfectly cooked bacon. The toppings were generous and went to the entire edge of the pizza. 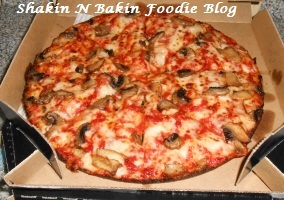 They did NOT skimp on any of the toppings and we were very impressed with that! The taste? 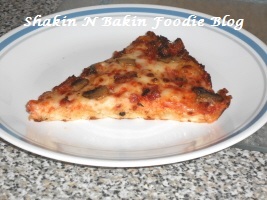 Oh my gosh...these pizzas are absolutely FABULOUS! The crust has a buttery taste with a nice crispy texture. The toppings were fresh and tasted delicious! The cheeses that they used were just perfect and were perfectly melted to perfection! Seriously, I don't know how they could improve these new Handmade Pan Pizzas to make them any better as we feel they are PERFECT already! The Parmesan Bread Bites come in a cute little paper serving bag and they were chewy and very flavorful. You could taste the Parmesan cheese in every little bite. They were hot, tasty and chewy! The perfect pizza side! My family had the entire little bag of Parmesan Bread Bites devoured in less than 5 minutes flat! Delish! When we have our family pizza nights we will definitely be ordering some more Handmade Pan Pizzas from Domino's. Next time around we are going to try them with some different toppings on them and we are sure they will be just as good! The next time your family is having a pizza night, we suggest that you order the new Handmade Pan Pizza from Domino's and give them a try. We think you will love them! Thanks Domino's!